The U.S. Fish and Wildlife Service, with assistance and guidance from the U.S. Geological Survey, states, and other partners, has developed a cost-effective conservation strategy for 36 imperiled freshwater fish and mussel species in the 22,360 square-mile Upper Tennessee River Basin. The strategy identifies aquatic species conservation objectives and recommends a management approach for conserving and recovering prioritized species and locations across the basin. It is designed to help the Service better integrate its efforts internally and with those of partners in North Carolina, Tennessee, and Virginia, whose missions complement the goal of maximizing conservation and recovery of imperiled aquatic species and the ecosystems upon which they depend. The U.S. Fish and Wildlife Service recently produced a video about conserving conserving imperiled aquatic species in the Upper Tennessee River Basin. Tennessee River pearls were featured in an episode of Antiques Roadshow from Knoxville, Tennessee. Pearls used to be plentiful throughout the Tennessee River prior to construction of multiple dams and were inexpensive to purchase. Now that the pearls and mussels are rare, the pearls are considered very valuable. The owner of the pearls shares her interesting story about how she acquired them. U.S. Fish and Wildlife Service recently posted a blog, "Getting mussels (and fish! moving in the Upper Tennessee River Basin", which details the Hart Ford Low-water bridge removal project in Scott County, Virginia. The project is located within the North Fork Holston River watershed in the Upper Tennessee River Basin and is home to 15 kinds of threatened and endangered freshwater mussels and three threatened types of fish; slender chub, spotfin chub, and yellowfin madtom. The 185-foot-long concrete Hart Ford low-water bridge was over a hundred years old, with dangerous cracks and with much debris blocking water flow. The river banks had retreated over 30 feet into the floodplain, creating a huge mess with increased rain. In April 2015, the bridge was removed. Partners brought in rootwads and large woody debris to grade and stabilize about 500 feet of riverbank, and stabilized an additional 150 feet of tributary ditches along the farm access road. Nearly two acres of native trees and shrubs were planted and installed livestock exclusion fencing was installed to protect the restored riverbanks. "When we think of river life, for many of us a handful of animals may come to mind – trout, smallmouth bass, muskie. But the southeastern United States is a hotbed of species diversity. 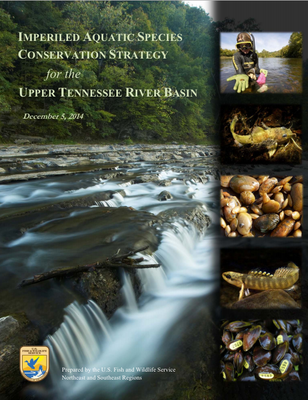 On that landscape, the Upper Tennessee River Basin (UTRB), covering much of the southern Appalachians, stands out with a whopping 255 species of fish and mussels known from the basin. Unfortunately, though the basin has an incredible diversity of stream life, a disappointing number of stream animals there are imperiled – the result of dams, water contamination and sedimentation. Of the 172 fish species historically known from the basin, 13 are on the federal List of Endangered and Threatened Wildlife, as are 32 of the 83 historically known mussel species. That means 45 species are threatened or endangered in a river basin covering an area about the size of West Virginia." On July 16, Dave Smith of the U.S. Geological Survey and Jess Jones of U.S. Fish and Wildlife Service gave a science seminar series presentation on the strategy to a variety of partners and stakeholders. You can watch the presentation here, which was titled "Using a structured decision making process for strategic conservation of imperiled aquatic species in the Upper Tennessee River Basin"